Road trips are often equated with summertime, or at least with the warmer months (and by warmer we mean no threat of snowy road conditions). But here’s the thing: we recreate outdoors all year here in Western Montana, so we’re always on the road driving from one ski hill, Nordic paradise or snowmobile trail to another, and we’re here to tell you this—the winter panoramas from the pavement here are pretty magical, and the stops along the way are, too. A winter road trip in Glacier Country is always good for a snow-season refresh, whether you get out for a few hours or a whole day, or you turn your travels into an overnight adventure. Never-ending bluebird skies against pure white snow sparkling in the sunshine? Yes please. Just outside of Ravalli, head west on Highway 200 traveling along with the Flathead River as it snakes through scenic valley vistas. You’ll pass through the small towns of Dixon—famous for their mouthwatering Dixon Melons—and Perma. As this two-lane highway winds down the valley, the mountains continue to get more and more grand. Head south on Highway 135, following the Clark Fork River down the St. Regis/Paradise Scenic Byway. Stop for a soak at Quinn’s Hot Springs Resort or a meal at their historic Harwood House Restaurant. Continue south down this picturesque mountain highway until you reach St. Regis. Stop at the St. Regis Travel Center for gas and a huckleberry shake, and don’t miss the free live trout aquarium! This four-lane highway takes you straight through the always-gorgeous Bitterroot Valley. From Missoula, drive south towards Lolo, admiring the many towering peaks of this picturesque range, like Lolo and St. Mary. Make an appointment with the Holt Heritage Museum for a history lesson on cowboy culture, American Indians and the Lewis and Clark Expedition. From Lolo, head to Florence and on through Stevensville, Victor and finally to Hamilton. Continue south on 93 until you see the right-hand turn for Lake Como Road. Follow that until you reach the Lake Como Group Picnic Site. Check the Bitterroot National Forest website for trail information, or just enjoy the views of Lake Como underneath Western Montana’s El Capitan and West Como Peak. Jump back on Highway 93 towards the quaint, Old West town of Darby, where you can fuel up on food and gas, or extend your trip with a stay at Alta Ranch—a great place for cross-country skiing. 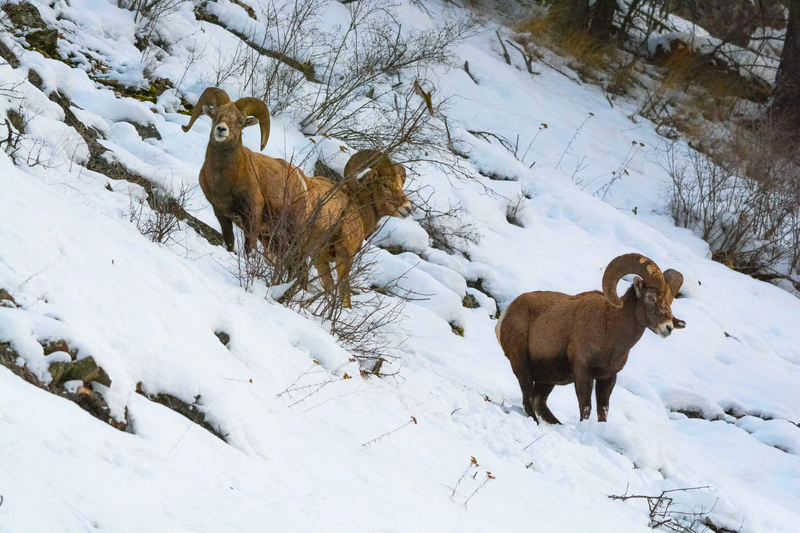 Highway 93 takes you past Lost Trail Powder Mountain and Chief Joseph Pass for more cross-country-country skiing, snowshoeing or winter hiking. Highway 12 into Idaho is one spectacular drive, especially in the winter. This two-lane highway weaves through the lush Lolo National Forest. Check out Travelers’ Rest State Park for a little Lewis and Clark history. Highway 12 follows West Fork Lolo Creek, and with the density of the trees and slope of the surrounding mountains, this beautiful drive makes you feel far away from it all. Take a much-deserved stop Lolo Hot Springs for a mineral soak, a warm meal or place to rest your head. Lolo Hot Springs is close to easy snowshoe and cross-country trails (Lolo Pass). Head back towards Lolo to enjoy a different view, but take it easy on this winding mountain road. When you’re back in Lolo, treat yourself to a steak dinner. Thousands travel this route throughout the summer months, but as a winter drive, it’s just as stunning. 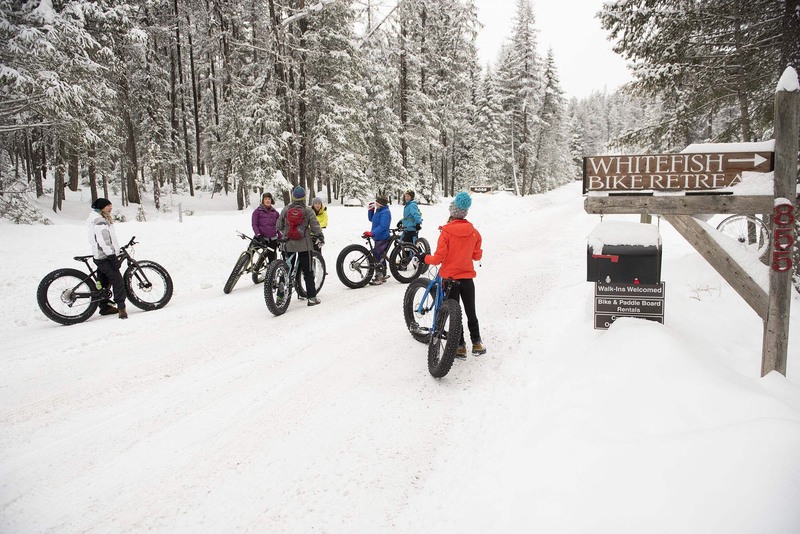 Begin in Whitefish with views of a winter Whitefish Lake, or take a fat-bike ride around Beaver Lake with Whitefish Bike Retreat. Outside of Whitefish, head south on Highway 93 to Highway 40 toward Columbia Falls. Highway 40 becomes Highway 2 as you drive into the mouth of this breathtaking canyon. 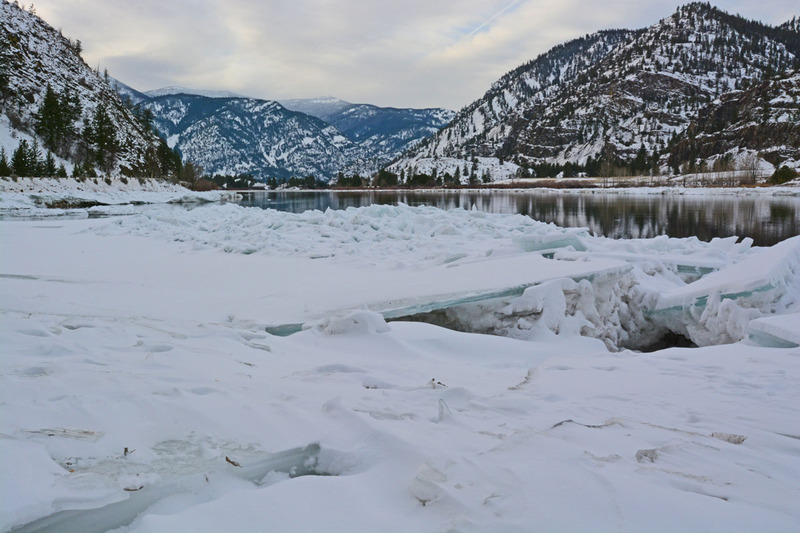 Covered in ice and snow, the Flathead River is truly stunning. Stop in Hungry Horse at the Huckleberry Patch for a slice of homemade Montana pie or fudge. Continue on Highway 2, making a stop at Glacier Distilling Company in Coram (be sure to designate your driver). Highway 2 passes through West Glacier, with access to Glacier National Park. 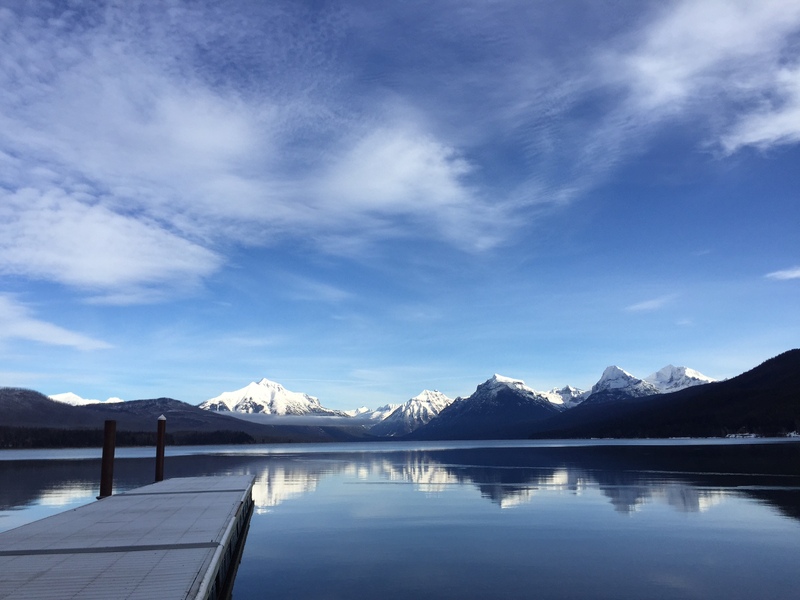 For winter access to Lake McDonald, head north to Apgar Village. The Apgar Visitor Center has weekend hours throughout the winter months. Make sure to check their hours online. The National Park Service also offers weekend ranger-guided snowshoe park tours January through March. Make sure to check the Going-to-the-Sun Road status to see how far into the park the road is open. Lake McDonald’s keeps its stunning allure all year long. See Flathead Lake from all sides. From Polson, head northwest on Highway 93. Stop by the Kwataqnuk Resort & Casino for a little extra fun. Stay on 93 towards Big Arm and Flathead State Park. Wraps around the “big arm” of the lake through Elmo, Dayton, and Rollins. Lakeside Motel & Resort offers relaxing and scenic lakeside lodging, plus delicious food. From Lakeside, continue north to Somers and then take a left on Highway 82, which will take you past Kalispell Bay and over the Flathead River, then turn onto Highway 35 heading south. Bigfork is a real charmer. Determine your designated driver and stop by Flathead Lake Brewing Company, or check out The Barn Antiques, Consignment & Gifts. Afterwards, travel on to the stellar winter lake views at Wayfarers/Flathead Lake State Park. We recommend taking it easy on this two-lane highway, for safety reasons and because the winter views of Flathead Lake are incredible. Continue on past Woods Bay towards Finley Point, where we recommend sitting down for dinner at Finley Point Grill. Taking the route from Essex to St. Mary is a unique way to see a very wintry Glacier Country. 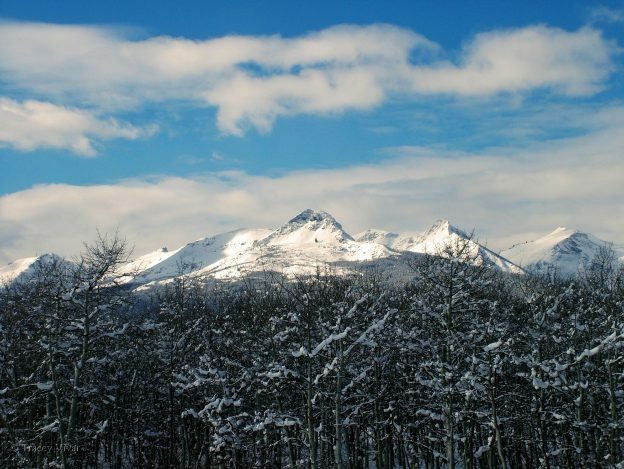 In Essex, start by cross-country skiing or snowshoeing from the Izaak Walton Inn. If you’re looking for a place to spend the night, rent one of their cabins or iconic renovated cabooses. From Essex, head east on Highway 2. This two-lane highway winds through the mountains, including Mt. 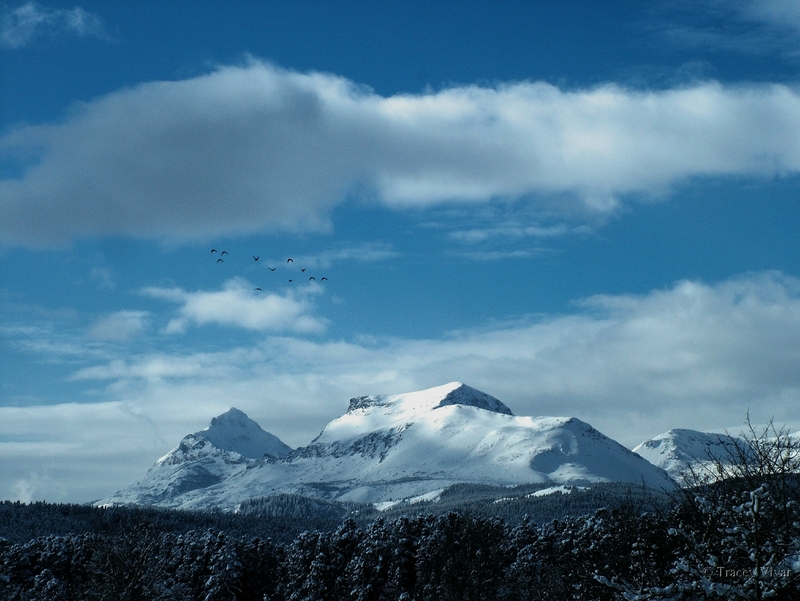 Furlong, Snowslip Mountain and Calf Robe Mountain. Wintertime in East Glacier is quiet, but you’ll enjoy the view of Glacier National Park’s peaks where they meet the plains of Eastern Montana. Take the more frequently traveled Highway 2 east towards Browning or the less-traveled Highway 49 north towards Lower Two Medicine Lake, which eventually meets Highway 89. In Browning, check out Faught’s Blackfeet Trading Post or the Museum of the Plains Indian for fascinating American Indian history. Beyond Browning, jump on Highway 89 heading west, passing through the small towns of Star and Kiowa. Continue north until you reach the junction back into the park to see Saint Mary Lake or Lower St. Mary Lake. Travel into Glacier National Park on the east side is a bit more limited than the west, but always know what’s open by checking road conditions online. Check out Montana Department of Transportation’s Travel Map for up-to-date road conditions. Travel with sleeping bags, blankets, extra water and food, extra warm clothes, and look ahead for where cell service may be spotty or nonexistent. Make sure your vehicle is well-maintained: working headlights and tail lights, coolant, windshield wipers, tire pressure, etc. Take it slow! Road conditions may change quickly. Assign a designated driver if consuming alcohol. Refuel when you can—in some areas, gas stations can be few and far between. Always check business hours before stopping, in case there are weather-related closings or changes. This entry was posted in Big Arm, Bigfork, Bitterroot Valley, Blackfeet Indian Reservation, Blackfeet Nation, Browning, Columbia Falls, Coram, Darby, Dayton, Dixon, Elmo, Essex, Family Fun, Flathead Valley, Florence, From The Road, Getting Around, Glacier National Park, Hamilton, Hot Springs, Hungry Horse, Lakeside, Lolo, Montana, Montana Fun, Native American Culture, Outdoor Fun, Paradise, Parks, Polson, Ravalli, Rollins, Somers, St. Mary, St. Regis, Stevensville, Sula, Things To Do, Tour 200, vacation, Victor, West Glacier, Whitefish, Wildlife, Winter Fun on January 17, 2018 by glaciermt.